Sensitivity: Four (4) detection sensitivity levels are selectable by means of two front panel mounted DIP switches. Vehicle detection results from a sufficient negative change in loop inductance. Detector Output Presence Hold Times / Pulse Modes: An internal DIP switch can be used to select the detector output presence hold time or pulse mode. When set to operate in Presence mode, the internal DIP switch can be used to select one of two presence hold times; Limited Presence or True Presence. Fail-Safe / Fail-Secure Operation: The detector is factory configured for Fail-Safe or Fail-Secure operation. When the detector is configured to operate in Fail-Safe mode, the output will assume a Detect output state (relay Normally Open contacts closed, relay Normally Closed contacts open) during a power loss or loop fault condition. Fail Indicator: The red Fail LED indicates whether or not the loop is currently within tolerance. If the loop is within tolerance, the Fail LED will be Off. If out of tolerance, the LED indicates a current loop failure by turning On (Open Loop) or flashing at a one Hz rate (Shorted Loop). Detector Reset: Changing the position of any DIP Switch (except the Frequency DIP switches) will reset the detector. The detector can also be reset by pressing the front panel mounted pushbutton labled RESET. 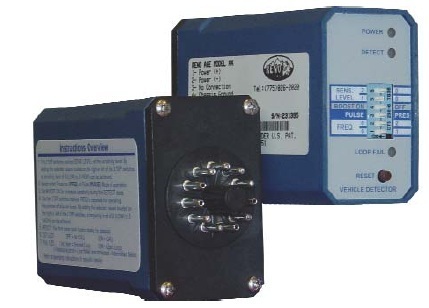 Ruggedized Construction: The detector enclosure is made from a high temperature rated plastic. Printed circuit boards are 0.062 inch thick FR4 material with 2 oz. copper on both sides and plated through holes. Operating Temperature: -30º F to +180º F (-34º C to +82º C). Size: 2.50 inches (6.35 cm) high x 1.55 inches (3.94 cm) wide x 3.50 inches (8.89 cm) deep (excluding connector). Weight: 7.6 oz (215.5 gm). Dependable product. 4 gates,only have had to change 2 in the past 12 years. Shipping was also quick!